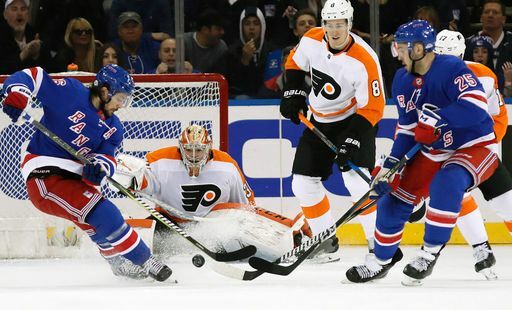 After nine days off, the Rangers return to the ice tonight to shake off the rust against the Flyers. The Rangers are keeping #TheVision intact by dressing 11 forwards and 7 defensemen, a move that is questionable at best when there are no injuries, the team has just finished nine days off, and the scratch is Pavel Buchnevich. This is likely the beginning of the end of the Blueshirts careers for a few players. Kevin Hayes is someone we have an eye on. Mats Zuccarello another, but he’s out tonight. Chris Kreider may be on his way out as well. There are other names being thrown out there, but those are the big three. The Flyers are trying to claw their way back to the playoffs, and the once last place team is now three points behind the Rangers. Anthony Stolarz gets the start. Crazy Prediction: All 7 defense get a point. It may get ugly tonight!!!!!!!!!!! Did you mean the possible feistiness or the play of the game itself? Yea We have 1 and 1/2 4th lines! I guess coach can have ADA play wing, he’s done it before. Right? Good thing Buchnevich isn’t dressed, Howden’s injury will give McLeod the chance to shine! When the Rangers announced their newest rookie coach, I promised myself to reserve judgement. But I am having a hard time trying to see the logic in sitting Buchnesvich while inserting cement hands McCloud into the lineup. I can only speculate that Buch must be on the trading block and the Rangers dont want to risk him being injuried. We should take bets now on which d’man sits when Quinn decides he should go with 12 forwards. If Buch goes to a good team 30 goals next year is in the cards. Let’s hope other Russian prospects and free agents aren’t take notice of this. It may be a blessing Buch did not play he might have banged in or setup a goal which would have hurt out lottery position.